Eating: Hand painted French chocolates. Still. I’m hoping that if I limit myself to just one a day, they’ll start to replenish themselves like the fish & loaves, & eventually I’ll have enough to feed 5,000! Or myself, for the next week or so. Wearing: “Work out clothes,” also known as my knit harem pants (like sweats, but chic, right?) & a men’s V neck. I know all of the scary gym people totally judge me, & I don’t blame them a bit! I am ridiculous. It began with the top-notch news that my $500 traffic ticket has been dismissed, which makes me want to dance around in my socks to Free Bird, & also Jailhouse Rock, until I absolutely drop! From which point I would go ahead & give a quick but sincere shout-out to the man upstairs, then recharge my batteries for a moment before skipping all 700 of the miles between here & home, to give Debra – the loveliest & most selfless of all human beings, whom I regretfully sideswiped with my sedan – the kiss that will change her life. Then, after three months of careful plotting & prodding around, I have finally received some fairly concrete affirmation that I will not be spending the summer peddling out free hush puppies on the street corner (again), but instead will be working for an organization I’m excited about, in a new city, writing, & getting PAID! Oh, good things are happening here. Also, it was sunny today, and warm. Just when I had begun to give in to the wintertime blues, and decided that spring might not actually ever come. Most of the snow is now finally melted, & I was able to pull out my candy apple bike for the first time & cruise about campus. There is so much more, but suddenly it is midnight! So it’s off to bed for now, cheri! All in all, it was a very fine day indeed. Here’s to many-a-more to come! 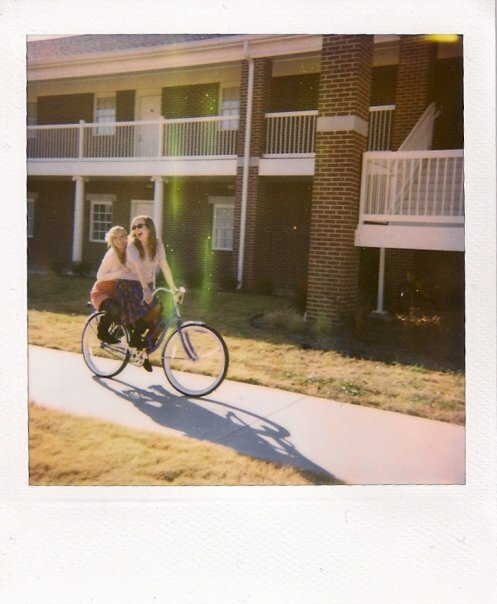 I was reminded of this photo, taken so many worlds ago, of Abby & I on her bike christened Joe.